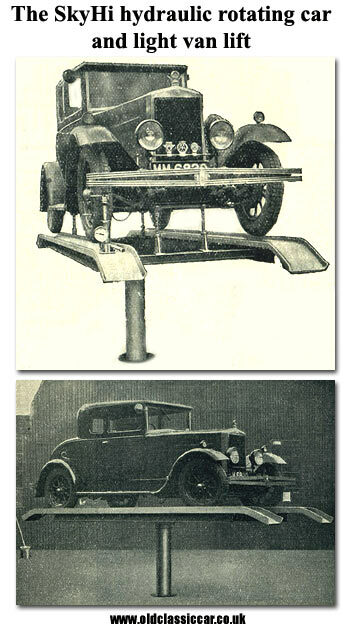 The 'SkyHi' rotating hydraulic car lift & brake tester from the 1930s. Homepage. 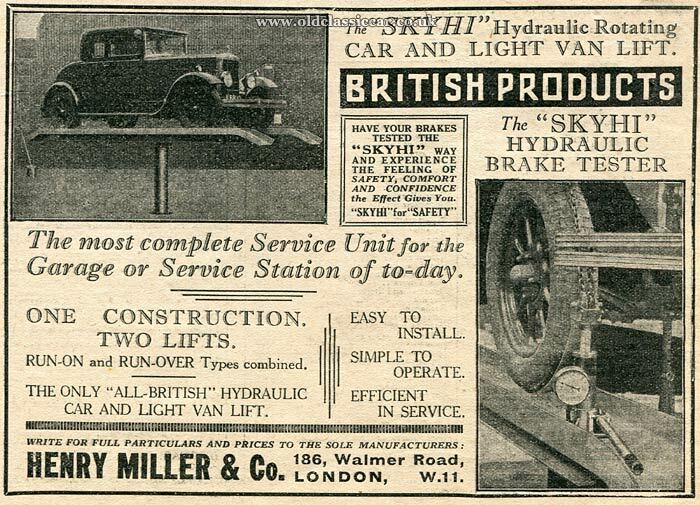 This page: Demonstrated with an early 1930s Morris, the Sky-Hi vehicle lift & hydraulic brake tester. Another handy piece of equipment, again dating to the 1930s. The SkyHi lift was designed to lift cars and light commercials, up to 3 tons in weight, and allow them to be rotated as required while up in the air, thanks to the SkyHi's hydraulics system. The vehicle could be raised in one of two ways, either manually - which took about 5 minutes - or else using a 2 H.P. motor, which would still take approximately 1 minute to get the vehicle to full working height. The dimensions of the SkyHi were such that even small cars such as the Austin 7 and Model Y Ford could be accommodated, right up to larger saloons and small vans should the need arise. The main lifting ram measured 6ins in width, and 6ft 6ins in height, allowing the car to be raised upto a comfortable working height. This would have made working on cars much easier, and quicker, than the usual pit arrangement. The SkyHi was really the forerunner of the 2- and 4-post lifts that garages use today, although lifting times have improved somewhat since then. Just as with modern hydraulic ramps, jacks could be used while the vehicle was up in the air, to raise the car and enable wheels to be removed, handy for any brake work. I don't know the asking price for the SkyHi rotating lift, but I'm sure only the larger garages and service agencies would have opted for this useful piece of equipment. A similar piece of equipment, the Wakefield centre-post car lift of the 1950s, can be seen on this page. Original advertisement for the lift & brake tester. An advertisement for the Skyhi dating to April 1930 has turned up. The two-door Morris again features, albeit from a different angle, perched on the lift. It was manufactured by Henry Miller & Co, of 186 Walmer Road in London W11. The road is now mainly residential, with a mix of 1930s and post-war buildings sprinkled along its length, a common sight in areas of the country that suffered badly during WW2, and at the hands of post-war city planners. In the advertisement there is reference to the Skyhi hydraulic brake tester. The photo isn't terribly clear, but shows a chain fitted around the circumference of the car's front tyre, connected to a hydraulic device on which a gauge - or brake efficiency meter - is attached. A period article regarding the brake tester advises that the car would be raised with all four wheels in the air. A hydraulic ram would then be attached to the car's steering column, this would depress the brake pedal, measuring the pressure required as it did so. A steel band and chain was installed around the outside of each tyre. A gadget not unlike a hydraulic bottle jack was then attached, and was used to measure how much pressure was required at each corner of the car, to turn the wheel with the brakes in operation. Adjustments could then be made as necessary, to balance each wheels' brake. Return to the car gadgets, tools & accessories section at oldclassiccar.